ACLU rallies tens of thousands of people across the US on Saturday, March 11th, to organize and #resist. 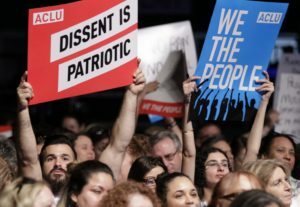 The ACLU is spending millions of dollars on a plunge into grass-roots politics — a “People Power” campaign. It’s the newest and largest development from a sprawling “resistance” movement that regularly moves faster than the Democratic Party’s leaders can think and isn’t waiting on politicians for cues. People Power debuted this weekend in south Florida and, by the organization’s estimate, at thousands of weekend house parties nationwide. Everyone who showed up received a nine-point plan to turn blue America into a network of “freedom cities” by defying the president’s executive orders, his health-care agenda and his Justice Department. Anyone who missed it could click on PeoplePower.org, the latest catchall website to find actions that would get results. The key to the effort: targeting Trump’s policies, rather than the man or his words. If 2016 taught Democrats anything, it’s that attacking Trump isn’t enough. There’s little apparent risk of that, and the biggest organizations on the left, broadly defined, are staffing up to give it direction. The Center for American Progress is planning a grass-roots conference for “rising” activist groups in California next month, and an ideas conference in Washington one month later. Super PACs such as American Priorities have become promotion machines for the Indivisible movement, which in just a few months has begun to organize some local chapters as official nonprofit groups. …no organization is transforming as quickly or as boldly as the ACLU. Since the 2016 election, it has tripled its membership to more than 1.2 million and raised more than $80 million, with plans to add 100 staff members to a team of about 300.